Smash Bros Mario VS Sonic. Mario and Sonic Characters Fight. Wallpaper and background images in the Super Smash Bros. Brawl club tagged: mario sonic. everyone but mario is getting beat, because Mario is too good to be hit, or is he? hey luigi is stronger than tails!!! yeeessss!!!!!!!!!! it is official sonic pwns!!! cmon amy U CAN BEAT HER!!!!! tails! beat luigi to death! 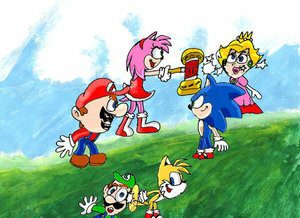 mario and sonic are just staring at each other. I don't think Tails has a chance against the green clothes guy. Peach is psychic, and he has considerable speed, for that, Amy, or can be defeated, or couldn't beat Peach easliy.